SLEBS + SOMETHINGS, a solo show of work by Dan Jamieson at l'Entrepot will be running for an extra two weeks. 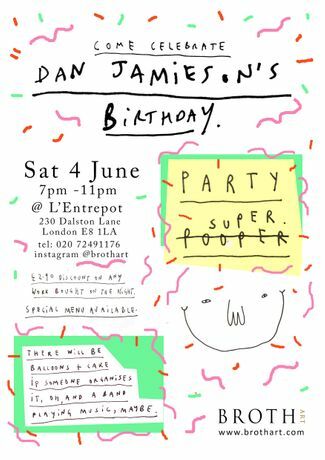 To celebrate we are having a party on Sat 4 June, (7pm - 11pm) which just so happens to fall on Dan's birthday. Due to popular demand, we are extending the exhibition, SLEBS + SOMETHINGS a solo show of work by Dan Jamieson for an extra two weeks (till Sun 19 June). 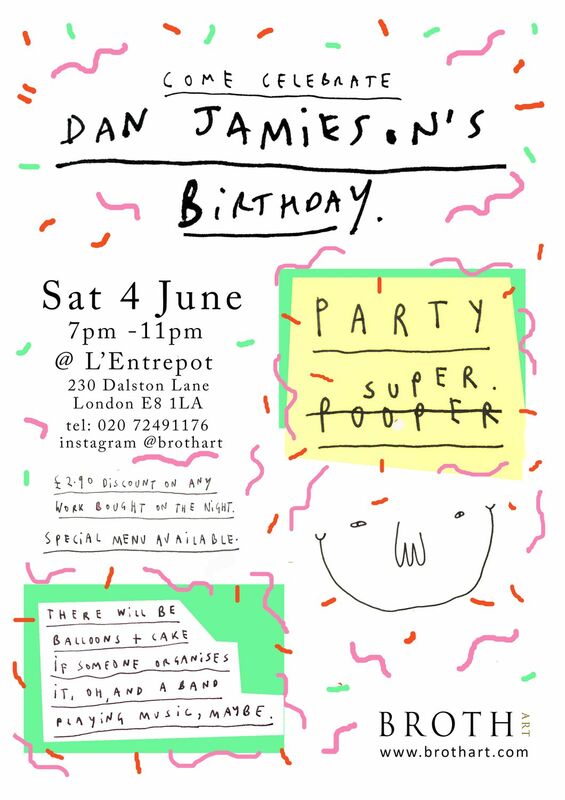 To celebrate we are hosting a big party on Sat 4 June (7pm - 11pm) which just so happens to be Dan Jamieson's birthday. To mark the artist's 29 years on this earth we're really making a night of it with balloons and live music and giving a £2.90 discount on any artwork bought that evening. SLEBS + SOMETHINGS is BROTH art's first solo art exhibition of work by the very original and award-winning caricature artist, Dan Jamieson. The current show at l'Entrepot on Dalston Lane, presents a brand new collection of Dan Jamieson's satirical drawings of celebrities and icons. Dan's humorous doodles have been making an impression since his degree show at Camberwell College of Art. His has worked with the likes of Rough Trade and Crate Brewery and will even be exhibiting a large collection of work at Wieden and Kennedy in Amsterdam from May till July this year. L’Entrepot lives on Dalston Lane and is run by three friends. Inside the space is attractive, huge ceilings in a warehouse style setting that caters as an eatery, a gallery, a place to sit and have a coffee and a place to drink and buy great wines. A date, your mate or your mam – it’s all bases covered. The compact menu is chock-full of tempting French leaning food and changes in harmony with the season. Their bar procures stock from many local and independent breweries and distilleries, and heralds a broad and exciting wine selection from Borough Wines. BROTH art is a company founded in 2014 by Kim Soep and is devoted to finding and nurturing artistic talent from across Europe and making works accessible to those looking to acquire original contemporary art. With no large grants or government subsidies, Kim has taken a grassroots approach to her business model which has helped her slowly but surely expand her business. She now works with 18 artists from across the UK, Norway and Sweden. Kim runs all aspects of the business herself, from curating and promoting pop-up exhibitions to sourcing and selling the art. Creatively thinking around the need for a commercial premises, Kim invites collectors and buyers to view artwork at her flat, an old Technical School in Hackney, by appointment only. BROTH is closely engaged with the vibrant London arts scene and participates in art fairs, pop-up exhibitions as well as online sales through its website. Since its debut, BROTH has participated in a number of art fairs - including The Affordable Art Fair and Islington Art Fair - collaborated with a fashion boutique and hosted several pop-up exhibitions across London.